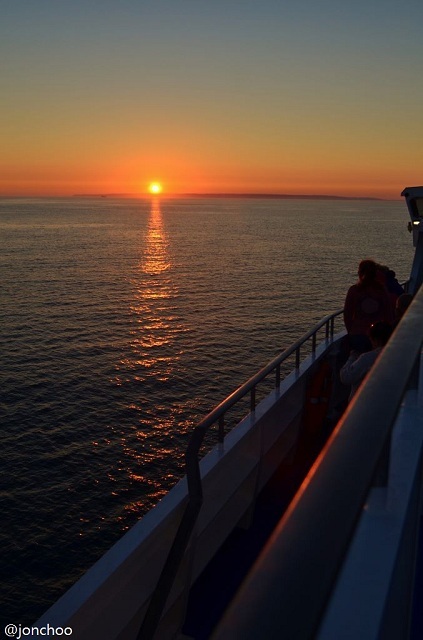 A trip to the Channel Islands was always on the card, but it was only two weeks ago that we were able to realise it. It was our first proper holiday in years, in that it doesn't involve camping or hosteling. We decided to treat ourselves a bit. 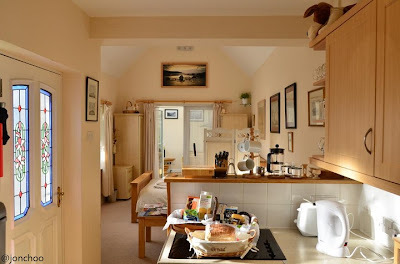 It was unfortunate we picked a peak season to visit but after much searching, we found a lovely self catering cottage in St Martin's Parish, just 20 minutes walk from St Peter Port in Guernsey. We choose a one bed maisonette from independent Tree Tops. For £475 a week, it came out at £68 a night - about half of what it would cost us if we went for a hotel or B&B. And because it has a fully equipped kitchen, we saved a heck a lot more money through home cooked meals. Richard, who runs Tree Tops, is a fantastic bloke. He has a wealth of knowledge of Guernsey and is funny to boot. A heck a lot funnier than Jimmy Carr in fact, who happened to have chosen the Channel Islands as his favourite tax haven. Richard also has a stable of bikes, including European-style bikes, which is available to residents, because he can't ride them all as he 'is old', as he puts it. 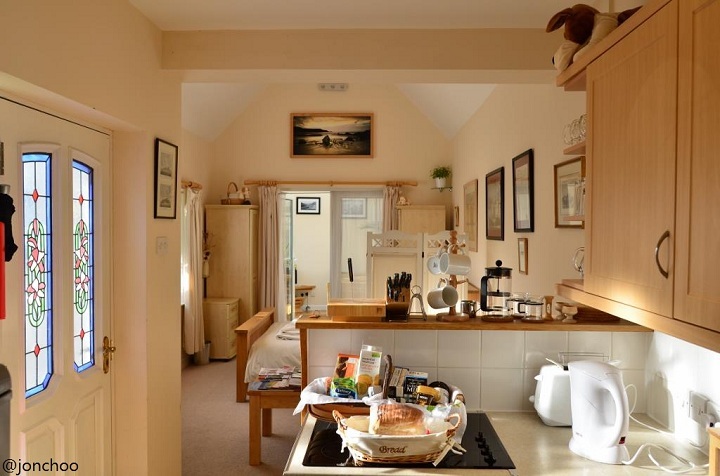 Our one bed maisonette cottage is modern, clean and in good size. It has a separate sun room, which can bake during the daytime, as well as a patio. It is about 20 minutes walk from St Peter Port, 10 minutes walk from St Martin village and 15 minutes walk from the beautiful Fermain Bay. It is also a short bus ride away from the secluded Le Petit Port Bay. After weeks of planning, we were worried that the weeks of heavy rain would not subside. Thankfully just as we arrived in Guernsey, the jet stream has decided to move north again taking with it the rain to Scotland (where we were initially planning our summer holiday - sorry Scotland!). There were days when there weren't any clouds and we could actually single out constellations with ease. Temperature during the day time stayed comfortably between 20-25C, with nigh time temperature dropping to around 15C. 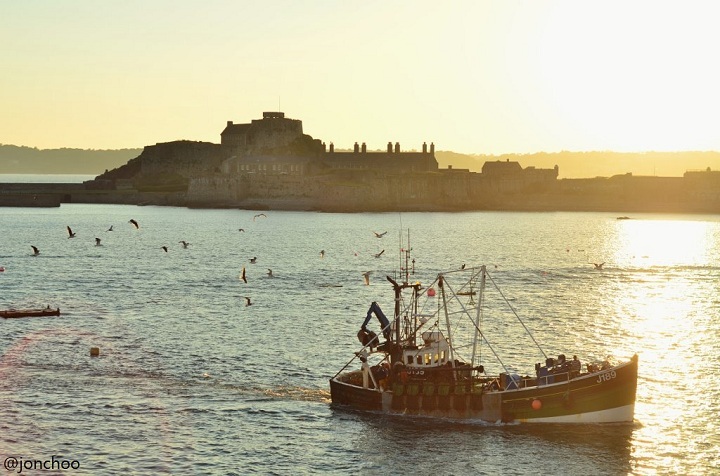 Guernsey is about 2 1/2 hour away via one of Condor Ferries few catamaran ferries from Poole (and Weymouth), with Jersey an additional hour away. The ferries can each take up to 800 passengers and 200 vehicles. The ferry terminals at both Poole and St Peter Port aren't up to the high standards you would expect. The one in Poole for example is located far from town and requires you to walk through a dodgy looking industrial yard before arriving at the passenger terminal. Still, the ferries are at least comfortable (when the seas aren't too rough). The on board store only opens once in open waters and they offer the usual assortment of duty free shopping including wine, spirits and fragrances. I found prices to be a heck a lot cheaper than what you find in airport terminals around the world. For a small island, there are plenty of things to do and explore in Guernsey. The buses are run by buses.gg and covers almost the entire island. Services are frequent - in fact more frequent than most other places we've been like the Lake District and Snowdonia. Travel is cheap too, with single journeys operating on a single £1 flat fee. There are no expensive travelcards to fleece you out of your hard earned money. Even better, you can get an Oyster-card like Ormer card and top up £25 giving you fifty journeys (50p per journey) which should cover you and a partner for two weeks. The southern side of the island are populated by cliffs and small isolated bays. 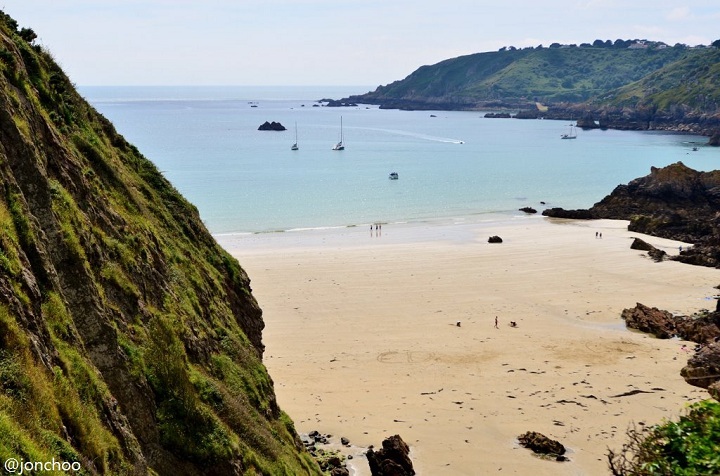 The most popular of these little bays are Fermain bay and Le Petit Bot Bay, and can get very busy. If you're the type of person who prefer to get away from it all, I do recommend Le Petit Port, a small beach accessible only by a 270-step stairs or boat. Do check the times for tides as the beach is completely submerged during high tides. Still, it is an unspoiled beach with white soft sands and clear water devoid of any sort of commercialisation. Long surf beaches are mainly located on the northern side of the island. Here is where islanders come out to play. These beaches can get very busy, though there are sections dedicated to swimmers only. 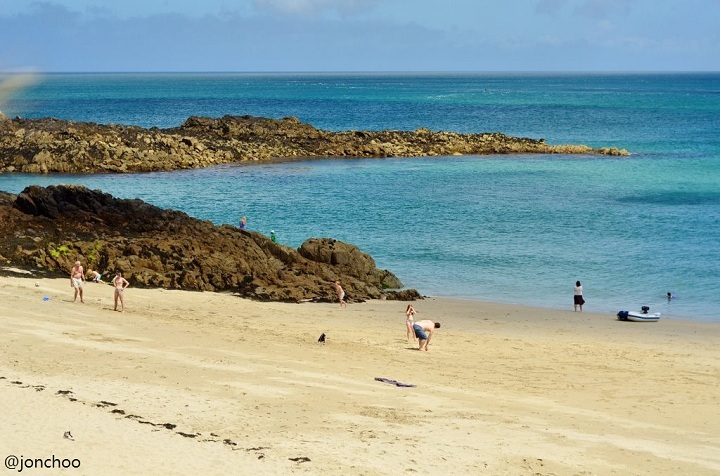 If there is one memorable activity you could do on a trip to Guernsey, on one of the clear evening, take the bus to Cobo beach and buy a fish and chip from Cobo Fish & Chip Bar (by the petrol station). 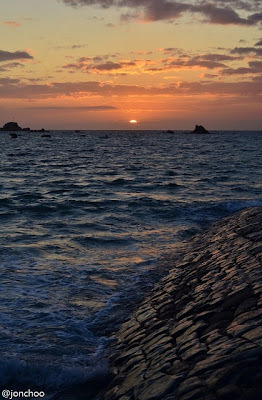 Then head down to the beach and sit against the sea defense wall (in parts to protect against high winds), and watch the beautiful sunset. It's rather stunning. When not swimming in ice cold water or topping up your tan, the cliffs on the southern part of the island are worth trekking. 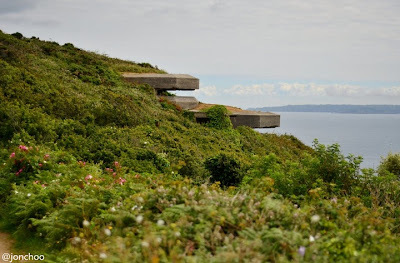 Dotted around these coastal paths are second world war pill boxes, including German fortifications. 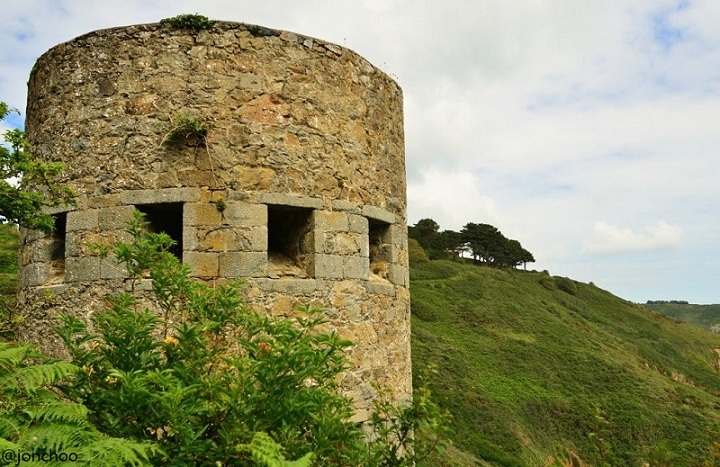 These fortifications were built as part of Hitler's coastal fortification project known as the Atlantic Wall. Many of these are in good conditions and serve as a reminder to the islanders of the occupation. You will also stumble upon Martello towers, forts built around the 19th century during the Napoleon war. 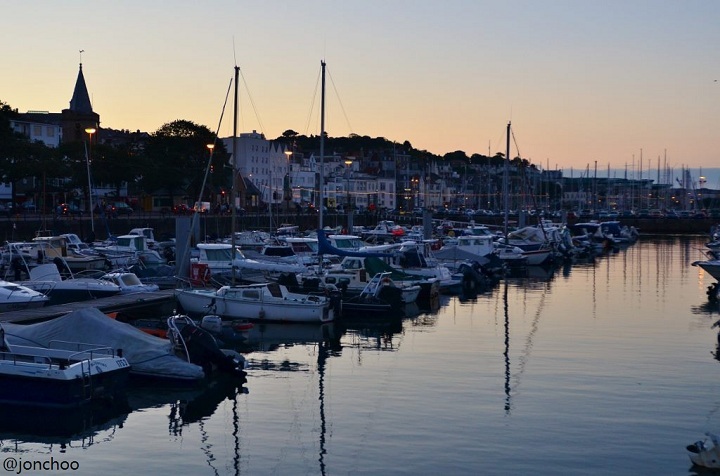 The Bailiwick of Guernsey is actually made up of several islands. 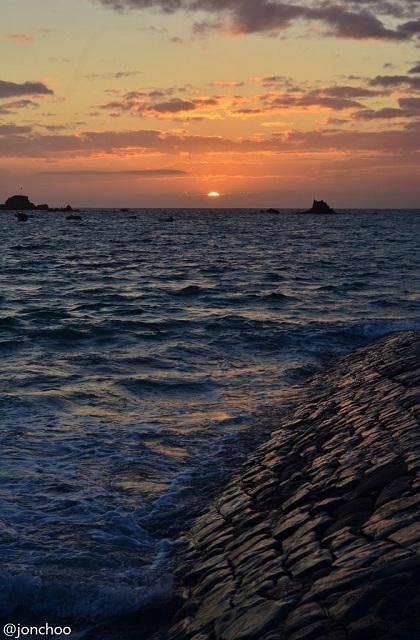 The largest of these are Guernsey itself, Herm, Sark and Alderney. Motorised vehicles are not allowed in Herm and Sark, with bicycles even completely disallowed in Herm. We had plans to visit all three of these smaller islands, but decided against doing so due to time constraints. 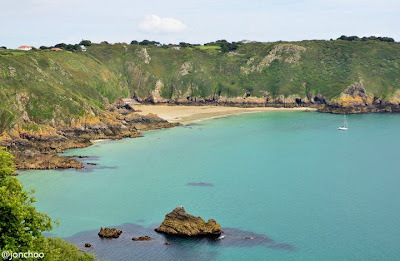 In the end we visited Herm twice, due to its proximity to Guernsey, but we are already making plans to revisit the Channel Islands so we can complete the other islands. 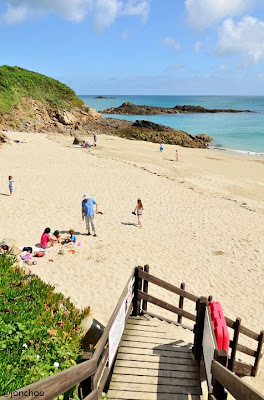 Despite being so close to Guernsey, visiting Herm is almost like visiting another country. Shell beach and the smaller Belvoir bay were simply stunning. In fact I overheard a visitor quipping that it felt like being in the Caribbean. While I have never been to the Caribbean myself, I've been visiting beaches in Malaysia since I was young. So believe me when I say I was impressed by the beaches here. Apart from a small cafe selling drinks and a two people renting out kayaks, Shell beach has not been commercialised. As a cynical Londoner, this is actually liberating. Even on the busiest Sunday, the beach was wide enough that you can be left alone with your thoughts. 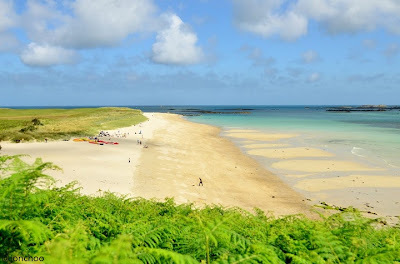 Herm itself has only a single hotel, a campsite, a couple of self catering cottages and a single pub. To get around you will need to walk as no vehicles and bicycles are allowed. 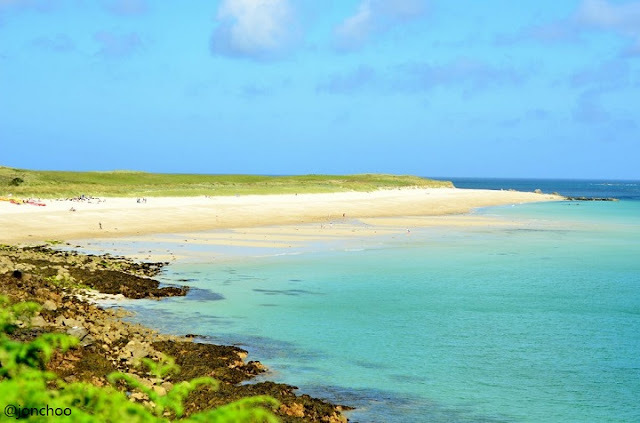 You will see the occasional tractors and quad bikes run by islanders but visitors are not allowed any action. It's a small island (about half the size of Hampstead Heath or only slighter bigger than Regent's Park in London), so getting around isn't a problem. But despite its diminutive size, there's still much to explore. We took a day off to travel to Jersey Island, an hour away via Condor Ferries. It costs £30 for a day return, which is rather pricey. As we arrived on a Sunday, we found most shops and cafes closed, but we made good on our day. Arriving at St Helier, it is almost immediate how different Jersey is compared to Guernsey. The port is modern, and you will see new flats going up all around. We walked from St Helier to St Aubin, taking in the vast view of Elizabeth Castle sitting inside St Aubin's Bay. Bike hires are also available. 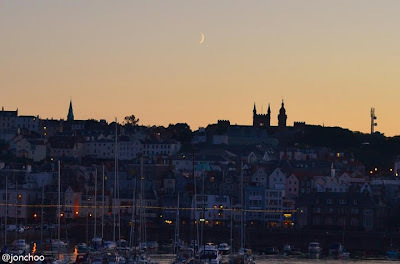 From St Aubin we continued walking up a steep hill through a small residential area (where I reckon houses are priced in the tens of millions). With large Spanish houses dominated by fields, there is a quaint Mediterranean feel here. 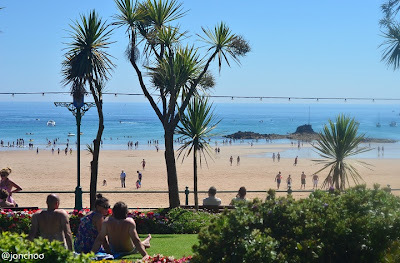 After some time we arrived at St Brelade's Bay, the creme of the crop of fun beaches so to speak. The sands here are soft and golden, and despite the commercial nature of the area, the water is clean. Some has even called it the best beach in Britain. If you are here for peace and quiet then you can forget it. There are a couple of areas where it may be possible to seek shelter away for some alone time, but this will be rare on a good summer days like the day when we visited. You will find kayaks, trampolines and banana boat rides on offer. Amenities are also not in short supply as cafes, restaurants, bars and hotels can be found at various locations alongside the bay. We had lunch at OysterBox, a popular family owned restaurant that specialises in seafood. 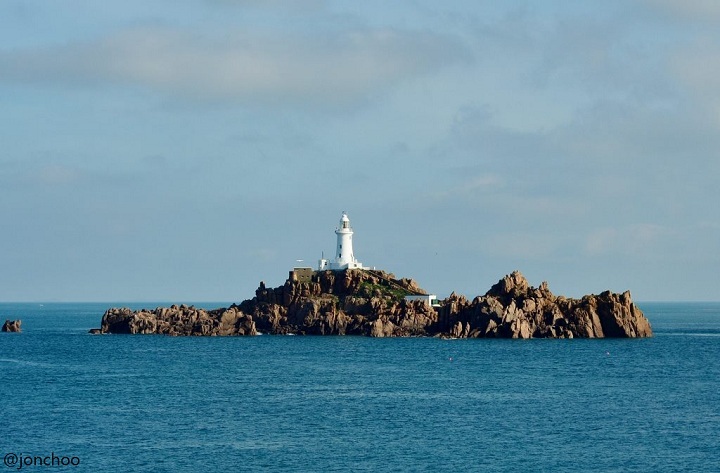 La Corbière lighthouse is another stunning attraction that Jersey was able to offer us on our short visit. Like the Elizabeth Castle in St Helier, the lighthouse sits on a tidal island and is only accessible via a causeway during low tides. A German MP2 observation tower (now converted into a holiday home) and other World War II fortifications are scattered nearby. Incidentally, bus rides in Jersey are rather expensive as they've opted for the whole travelcard business model. 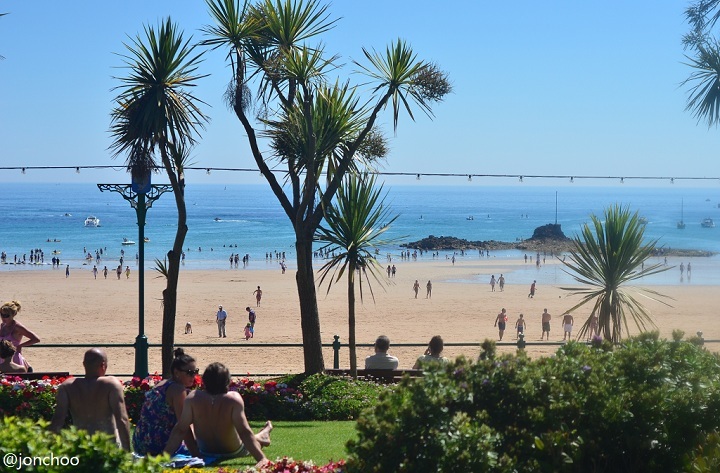 We spent more on buses on that single day in Jersey than we did in one week in Guernsey! The Channel Islands has somewhat been a revelation for us. Here are a bunch of islands, not too far from mainland Britain where unspoiled beaches are often less than 30 minutes walk away. Politics and tax issues aside, it proves that you do not have to fly half way across the world to get a cracking holiday. 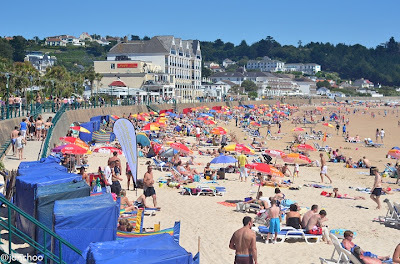 We've already discovered in our other trips to the Isle of Skye and Mull in Scotland and Pembrokeshire and North Wales that there are stunning coasts and beaches in Britain, so why are people queuing up to fly to Barbados or Maldives during the peak summer season is beyond me. As for us, we will be back. This blog is intresting.Meditek Engineers are a most respected and reliable name in a comprehensive range of Hospital equipment designed and devised according to the needs of comfort of the customer.Motorised Beds. Really a beautiful article about your experiences in channel island. 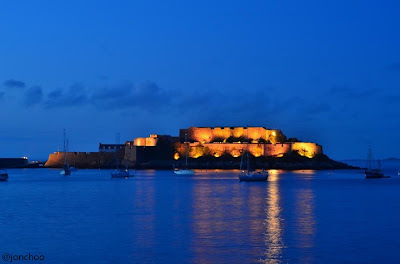 Yes , there are lot more things can be done on the little island jersey like sea and land activities, adventurous games, different island experience, fresh sea food with wide variety of hotels and restaurants.